Environmental groups in Maine have raised concerns about potential environmental harm to the St. John Valley if a massive pipeline proposal from TransCanada is approved. The Energy East pipeline, submitted to Canadian regulators for approval this week, would transport tar sands crude oil from Alberta east to New Brunswick. Four conservation groups said Thursday they are launching a campaign to warn northern and eastern Maine residents about possible environmental harms from a $10.8 billion crude oil pipeline proposed by TransCanada. The announcement came in response to the company’s filing of a formal application to build North America’s largest and longest crude oil pipeline, with a combination of new and existing pipelines that would transport tar sands oil west from the oil-rich province of Alberta. The Energy East proposal would end in Saint John, New Brunswick, requiring construction of new pipelines in five Canadian provinces and conversion of natural gas pipelines to carry the oil. TransCanada said the exact route is still undetermined, but the project faces challenges from more within the oil and gas industry as well. The pipeline could carry about 1.1 million barrels of oil per day over 2,860 miles to reach New Brunswick and, as it passes around Maine, could come within 20 miles of the border. The Natural Resources Council of Maine, Sierra Club of Maine, Environment Maine and 350 Maine challenged that statement Thursday, warning that a spill from such a pipeline could pollute tributaries of the St. John River. They also warned that the project threatens to speed up climate change by bolstering tar sands production. Glen Brand of the Sierra Club said increased tanker traffic to serve the pipeline in New Brunswick also stands to threaten habitats for right whales and the St. Lawrence beluga whale near a proposed terminal in Cacouna, Quebec. The company announced last year a joint venture with Irving Oil to build, own and operate a new deepwater marine terminal in Saint John, New Brunswick. Early Thursday, TransCanada president and CEO Russ Girling said in a statement that the company’s application delivered to Canada’s National Energy Board in 68 binders took 18 months to prepare and intends to capture a growing market for crude oil produced in North America. “Our application outlines how Energy East will be built and operated in a safe and environmentally responsible manner, while generating significant benefits for all Canadians,” Girling said. TransCanada has proposed the pipeline as an alternative to the controversial Keystone XL line that would also start in Hardisty, Alberta, but would run through the middle of the United States down to Houston, Texas. That project has awaited approval in the United States for more than six years. Canada’s regulatory process and timing is set by law. 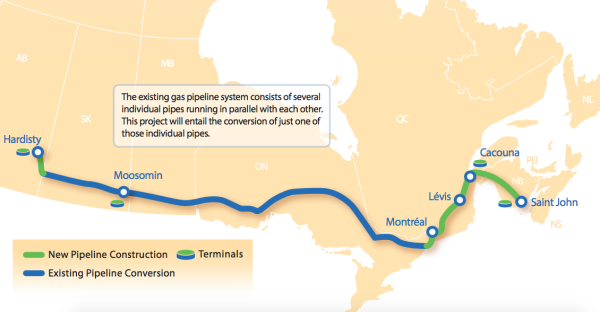 Reuters reported Quebec’s Gaz Metro and units of Spectra Energy are concerned about the plan because it would convert a mainline pipe in eastern Ontario to transport oil, replacing the line that now transports natural gas with a smaller pipeline. Gaz Metro said the company’s plan would reduce gas capacity in central Canada by 20 percent and lead to shortages during cold winter months, as New England experiences now. But building a replacement line the same size as the 155-mile mainline could add up to $1 billion to the project. Karl Johannson, president of natural gas pipelines at TransCanada, told Reuters on Oct. 16 that the economic viability of the project is tied to re-purposing the 1950s-era mainline. The company estimated in its study that spans environmental, economic and social impacts that it would create about 14,000 direct and indirect full-time jobs during all phases of development and construction and would lead to about $7 billion (Canadian) in tax revenue over 20 years.